Music Generation Laois works in partnership with Laois School of Music to deliver whole-class, group and one-to-one violin lessons in Co Laois. Music Generation Laois & Laois School of Music are now seeking submissions from an experienced Violin Tutor to deliver our programmes. Training in whole-class string tuition will be provided to the successful candidate. About: Music Generation Laois is a performance music education service for children and young people in Co Laois. 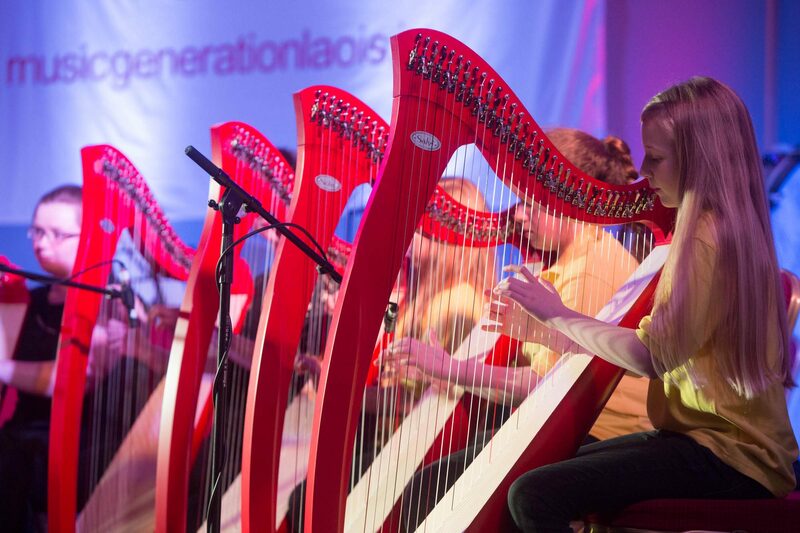 Music Generation Laois is part of Music Generation – Ireland’s National Music Education Programme, initiated by Music Network and co-funded by U2, The Ireland Funds together with, The Department of Education and Skills and Local Music Education Partnerships. Locally, Music Generation Laois is funded by Laois County Council, Laois-Offaly Education and Training Board and Laois Partnership Company. 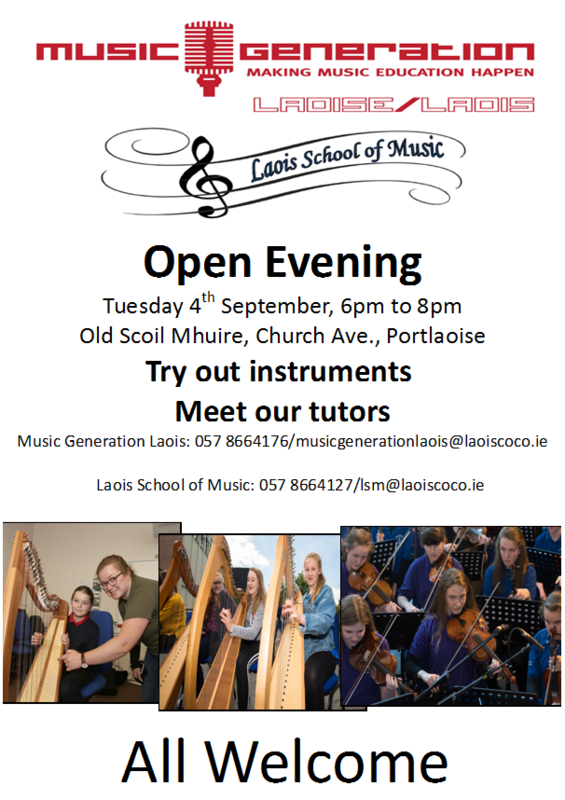 Laois School of Music was established in September 2001. The Arts Office of Laois County Council identified a significant deficit in the provision of musical education in the Midlands region. In order to bring this concept to fruition, Laois County Council recognized the need for a partnership approach with Laois V.E.C (now Laois Offaly ETB) and the Arts Council. The development of music was one of the principal objectives under the Arts in Laois Development Plan 2001-2003. Laois County Council, with assistance from Laois V.E.C. and the Arts Council, prioritised this art form in establishing the Laois School of Music. We are delighted to announce the recommencement of our Music Generation Laois Harp Orchestra. Siobhan Buckley is composing music for the orchestra, to be premiered as part of National Harp Day 2018. PLEASE NOTE, NO STUDENT WILL BE REQUIRED FOR THE ENTIRE DURATION OF REHEARSALS, ONCE WE KNOW WHO IS JOINING, WE WILL BREAK REHERSALS INTO SECTIONS! 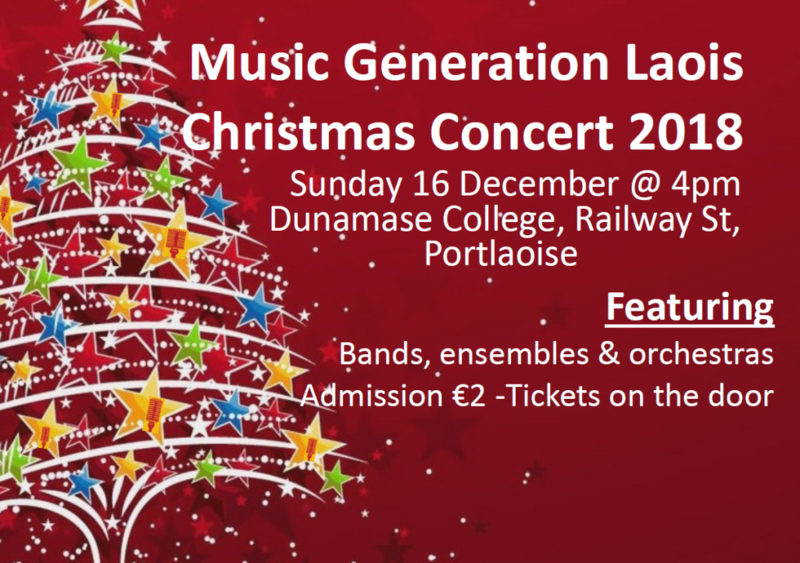 Please note, the orchestra is only open to harp students from Music Generation Laois, ie. those in our schools programmes and those who attend classes in our centre. Spaces are limited on a first-come-first-serve basis, please email musicgenerationlaois@laoiscoco.ie or call 057 8664176 to sign up for the orchestra. Applications are now open for high-standard, dedicated young trad musicians to join the Music Generation Laois Trad Orchestra . Membership is for 2018 and will commence in January 2018. Weekly rehearsal: Successful applicants must be available for weekly rehearsal on Saturdays from 10am-11:30am. Attendance is strictly monitored, if members miss more than 3 rehearsals throughout the academic year, their membership will be relinquished. Fee: Annual orchestra membership fee €100. How to apply: Spaces are allocated on an audition basis – send an email to musicgenerationlaois@laoiscoco.ie with your name, date of birth, instrument(s), standard (how many years you have been playing, any significant performances or achievements in this time), Parent/Guardian contact telephone number (for those under 18) and home address. Note, as this is an advanced ensemble, expression of interest emails are to come from young people, applications made by parents/guardians on behalf of their child will not be accepted. Auditions: Successful applicants will audition on Tuesday 5th December in the Portlaoise Further Education & Training Centre. The Music Generation Laois Trad Orchestra was established in January 2016 under the directorship of Paul Finn and Siobhan Buckley. In May 2016, the orchestra collaborated with Donegal Accordionist Martin Tourish to create a new 30 minute suite of music ‘1916 Visions and Voices’ funded by the Laois 2016 Community Fund, Per Cent for Art through Laois County Council and the Music Generation Arts Council Partnership. The music was premiered on the 22 of May 2016, as part of the Music Generation Laois New Works Series, to unprecedented public response! The work has since been performed in Fleadh Cheoil na hEireann in Ennis 2016, for Canadian Prime Minister Justin Trudeau and Taoiseach Leo Varadkar in Dublin Castle and in Powerscourt for the Ireland Funds Worldwide Conference attended by Taoiseach Leo Varadkar and Prince Albert of Monaco. The Trad Orchestra performed on the Gig Rig at Fleadh Cheoil na hEireann once again in 2017 and have worked with acclaimed composer Ryan Molloy and have had workshops with brilliant Irish musicians such as Michael Rooney and members of Goitse. Please note: This is a highly professional youth ensemble, repeated absenteeism is not acceptable nor is poor timekeeping. Frequently additional rehearsals and performances are added and these are mandatory. Young musicians must come prepared to rehearsals. Poor conduct and irresponsible behaviour is not accepted in line with the expectations around adult professional musicians.